If you’d like to learn more about trading, gold and the secular bull market… here’s an invitation to a private event Sunday night, after the super bowl. Enter your name, email address and whatever question you have for me. This entry was posted in Uncategorized on January 31, 2011 by Gary. All markets are subject to the forces of regression. Newton’s basic laws of motion; Action and reaction. At current levels both the S&P and Nasdaq 100 are stretched further above the 200 day moving average that virtually any other time in the last 10 years. Not surprisingly the further a market stretches in one direction the harder it snaps back in the other once the forces of regression gets its hooks into the market. The Fed is exacerbating this process with their constant meddling in the markets. The flood of liquidity unleashed by Greenspan and Bernanke from 2002 to 2007 in the vain attempt to abort the bear market was directly responsible for creating the conditions that led to the market crash of 08/09. The rally last April was pushed much higher than it would normally have risen by the forces unleashed during QE1. The end result; the correction when it finally came was much more severe than it would have been normally, even including a mini-crash in May. QE2 has now driven the market even further above the mean than in April. Unless the law of action and reaction has been repealed we should soon see an extreme regression to the mean event . I believe the Fed has put into place the conditions that will bring about the end of this cyclical bull market and usher in the next leg down in the secular bear. During the next 3 months we should see the dollar begin to collapse down into the 3 year cycle low unleashing the currency crisis we’ve been expecting. This will drive a massive surge in inflationary pressure that will poison the fragile recovery and send the global economy back down into the next recession. A recession that should be much worse than the last one as it will begin with economic conditions much weaker than in `07. The last time the Fed did this it produced a brief period of prosperity by creating a real estate and credit bubble. We all know how that ended. 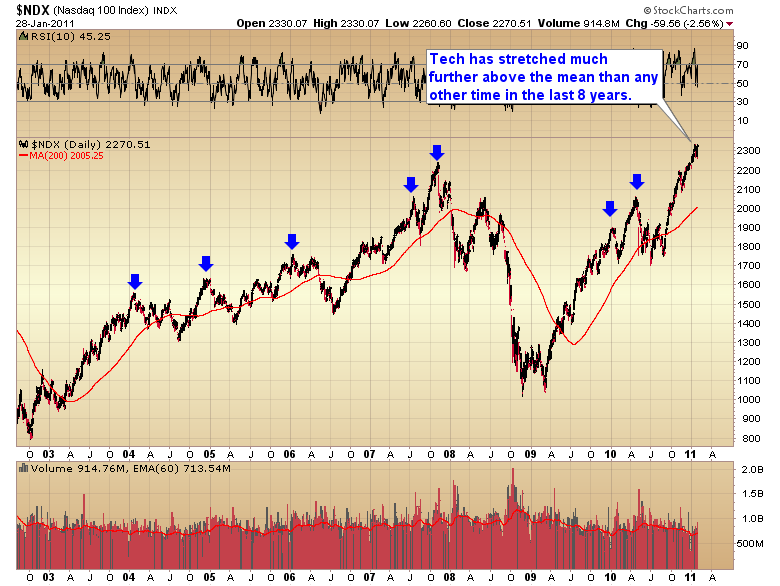 This time I expect the party to last two years tops, which means this cyclical bull should top by March. In their ill fated attempt to get something for nothing the Fed is going to cause a currency crisis and a massive surge in global inflation. The price we will all pay when the house of cards comes crashing down again will be multiples more expensive than last time. This entry was posted in Uncategorized on January 30, 2011 by Gary. I’ve unlocked the archives for anyone who wants to browse past reports. This entry was posted in Uncategorized on January 28, 2011 by Gary. I’ve posted a trading “plan” for the precious metals sector in tonight’s report for subscribers. This entry was posted in Uncategorized on January 27, 2011 by Gary. Warning signs are starting to build. 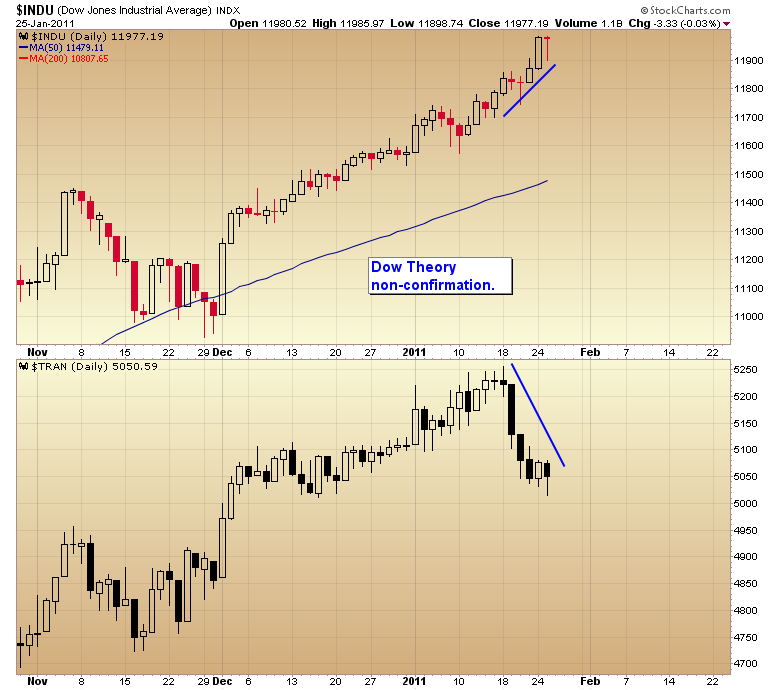 To start we have a Dow Theory non-confirmation. Usually this is a sign of distribution. 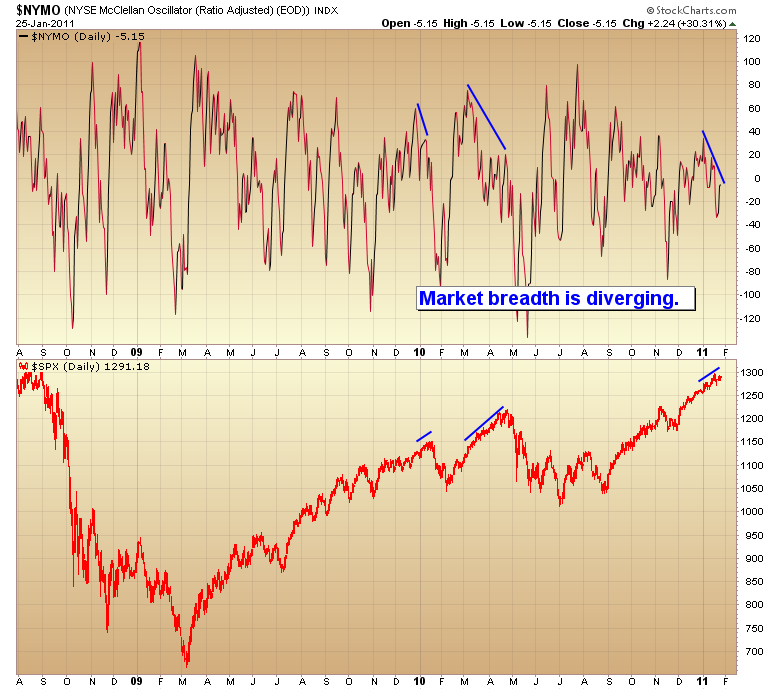 Breadth is diverging. This often happens at intermediate tops. 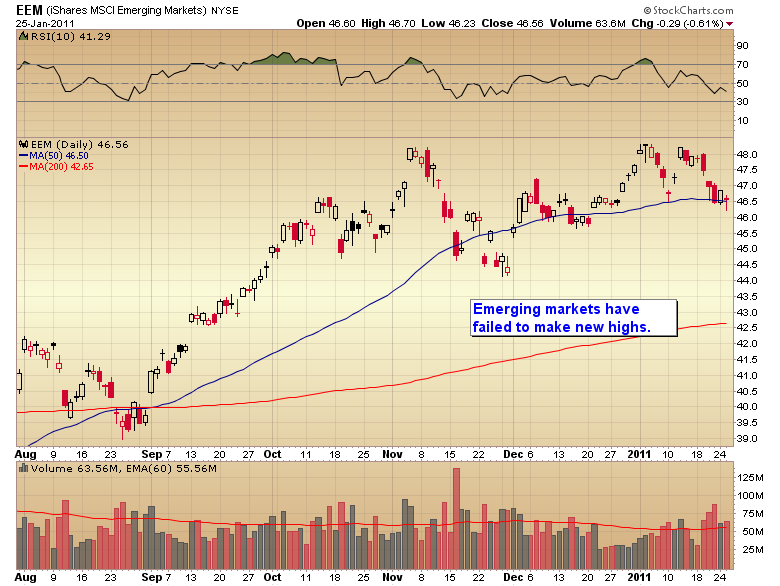 Emerging markets have failed to make new highs. 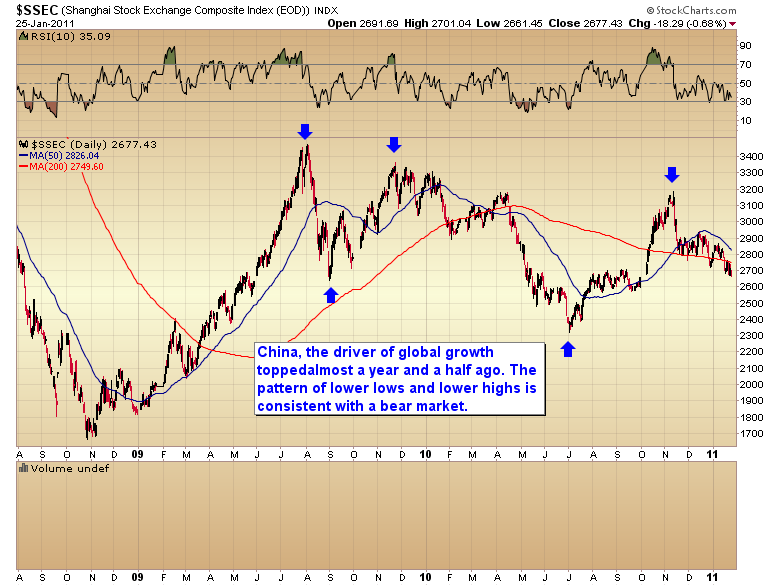 China, the driver of global growth appears to be in a bear market. Oil has now broken the pattern of higher lows. 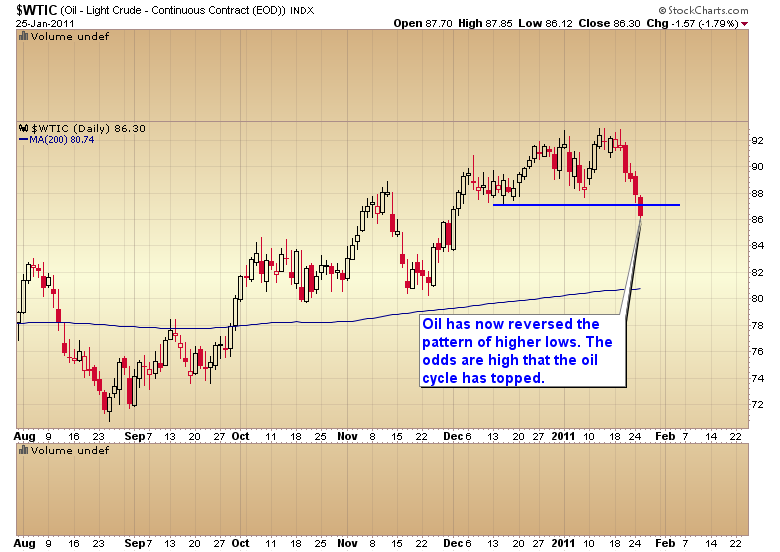 The odds are high that the oil cycle has topped. Throw in the fact that the current daily & intermediate cycles are stretching and the risks are very high on the long side at this point. This entry was posted in Uncategorized on January 26, 2011 by Gary. I’ve noted in the nightly updates that gold is now deep in the timing band for a daily cycle low. My best guess is gold should tag the 38% Fibonacci retracement before bouncing out of that short term bottom. However the stock market still hasn’t moved down into it’s yearly cycle low yet.Both gold and stocks are now due for a major yearly cycle low. This is a much higher degree correction than a daily or intermediate cycle pullback. 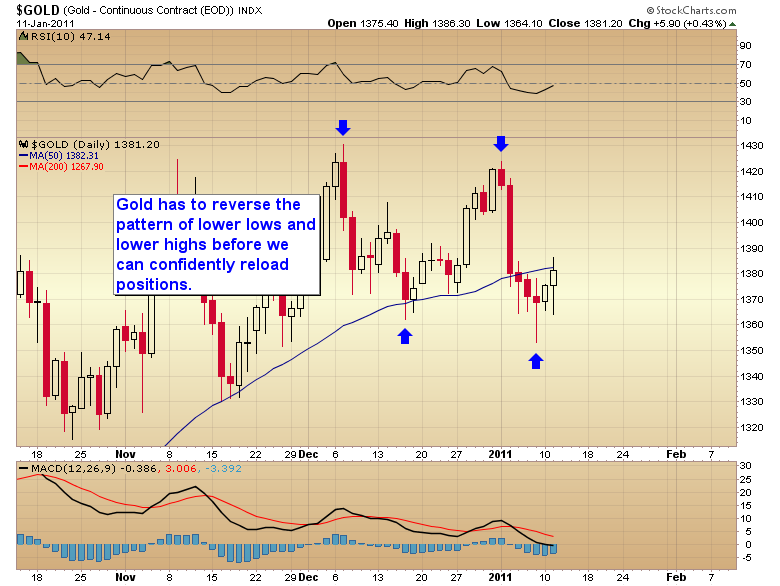 So the corrective moves in both gold and stocks should be very severe. 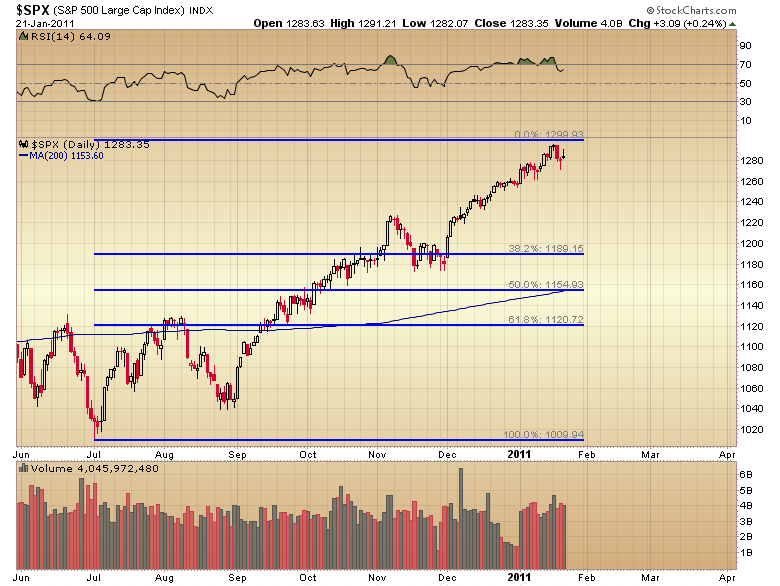 I would be very surprised if both don’t correct at least to the 50% retracement. Notice on the gold chart how the rally out of the yearly cycle low in the dollar halted (temporarily) the C-wave rally in gold. The dollar is now moving into the timing band for another short term bottom. I expect the rally out of that coming bottom to drive the final leg down in gold and to power the move down into the yearly cycle low for stocks. 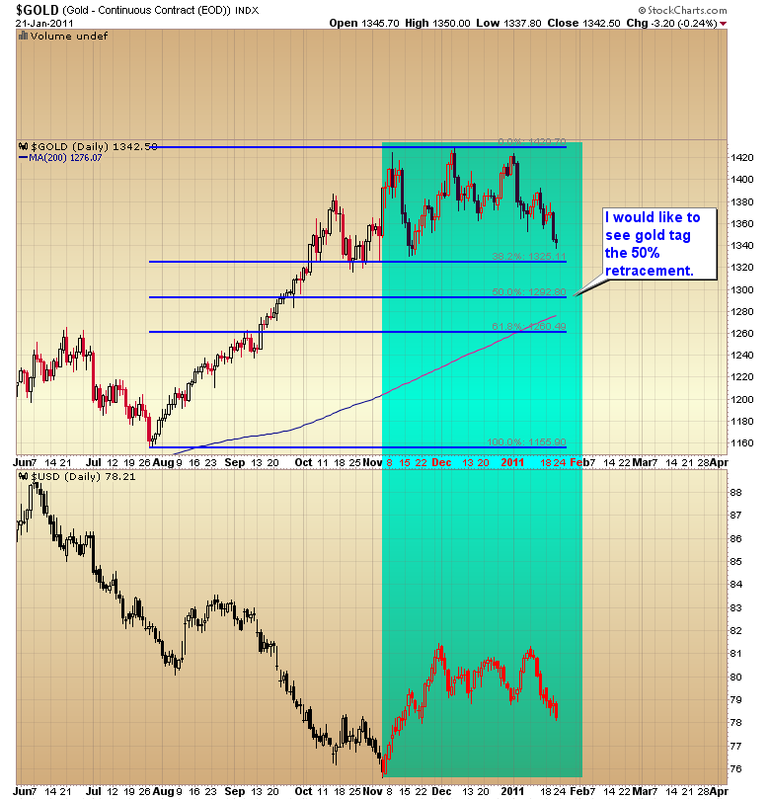 While I fully expect gold to bounce off the 38% retracement I doubt that will be the end of the correction. A yearly cycle low usually has to do more damage than that, especially if it’s coupled with the massive selling pressure of stocks also moving down into a yearly cycle low. Those that want to speculate could enter precious metal positions at around $1325, but be prepared to get stopped out if gold dips back below that point next week on it’s way down to $1290. Personally I’m going to wait until I think the stock market has bottomed before I’m ready to jump back into heavy positions. This entry was posted in Uncategorized on January 24, 2011 by Gary. This will be the last day for the $10 subscription offer. This entry was posted in Uncategorized on January 20, 2011 by Gary. An intraday post has been made to the website. This entry was posted in Uncategorized on January 18, 2011 by Gary. Unfortunately because we couldn’t read the writing on the wall we trusted that the Fed would “fix” this minor blip but cutting rates aggressively and spewing out an avalanche of freshly counterfeited dollar bills. It did not fix the credit markets and instead spiked the price of oil to $147 a barrel. That turned out to be the final straw that broke the camels back and sent the global economy spiraling down into the worst recession since the Great Depression. The stock market rolled over into the second worst bear market in history. Amazingly enough we are ready to repeat this process all over again. The writing is on the wall and virtually no one can see it. I’m now going to lay out the the series of events that will ultimately lead to the next leg down in the secular bear market and the reaction by the Federal reserve that will end up pushing the economy over the edge into the next depression. 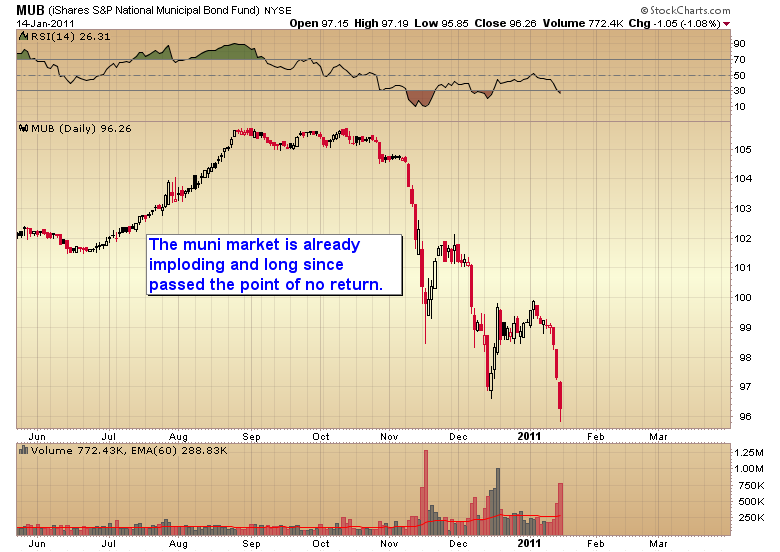 It is going to start in the municipal and state bond markets. I should say it’s already started. So far the stock market is ignoring the cancer growing in the city and state bond markets… just like it ignored the initial stages of the sub-prime implosion in the autumn of `07. At some point it is going to dawn on the market that there may be a serious problem developing. I expect that recognition to come as the market starts to drop down into the next intermediate cycle correction (which I expect to begin next week). If so, then what should start out as just a profit taking correction will turn into a much more serious decline, possibly even erasing all of the fall rally. 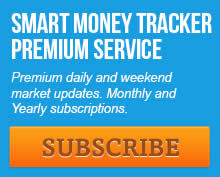 We’ve already seen big warning signs that smart money has been exiting this market for a couple of months now, basically since the first signs of stress in the muni markets appeared in November. Big money has used the QE driven rally to unload stock on the clueless public over the last several months. It will begin as the first cities and states start to default. That will correspond with massive layoffs as cities and states will no longer be able to borrow to meet payrolls. Their only option will be to make drastic cuts any and everywhere they can. The Fed will panic and start running the printing presses in overdrive just like they did in `08 and just like in `08 that will spike the price of energy and food (it’s already starting. Gasoline is back above $3.00 a gallon and a loaf of bread is pushing $4.50-$5.00). This will be the period when gold will enter the final leg up in its ongoing C-wave advance and the dollar will collapse down into the 3 year cycle low unleashing the currency crisis we’ve been expecting. I fully expect by fall the economy will be heading back into recession/depression and the global stock markets will have rolled over into the next leg down in the secular bear market that began in 2000 with the bursting of the tech bubble. This entry was posted in Uncategorized on January 15, 2011 by Gary. It’s still too soon to jump back into the precious metals sector. 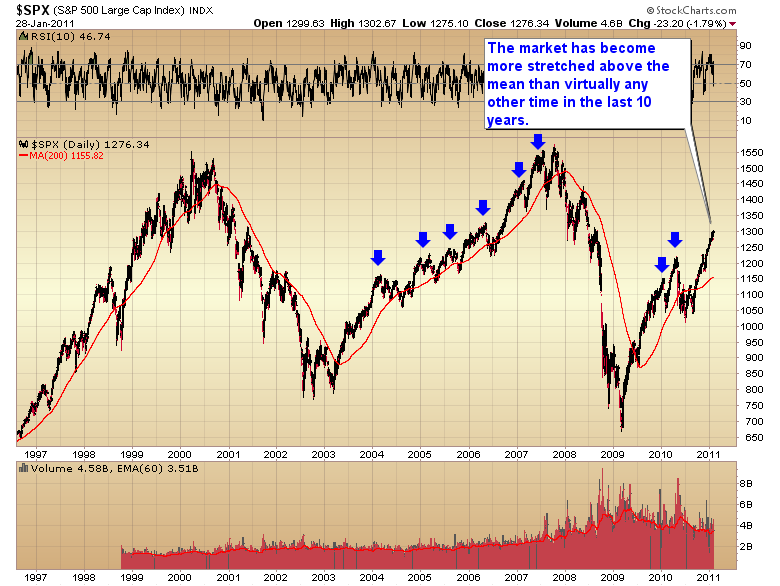 Gold is now due for a yearly cycle correction. A correction of that degree should take gold down to $1300 or lower. Maybe even as low as the $1265 breakout level. February will mark the one year anniversary of the last yearly cycle low. So we are now deep in the timing band for that correction. Gold is now in a down trend so perhaps it is working its way down into that major cycle low now. In order to jump in front of that trend we either need to see something that looks like a major yearly cycle low OR we need to see the down trend reversed. 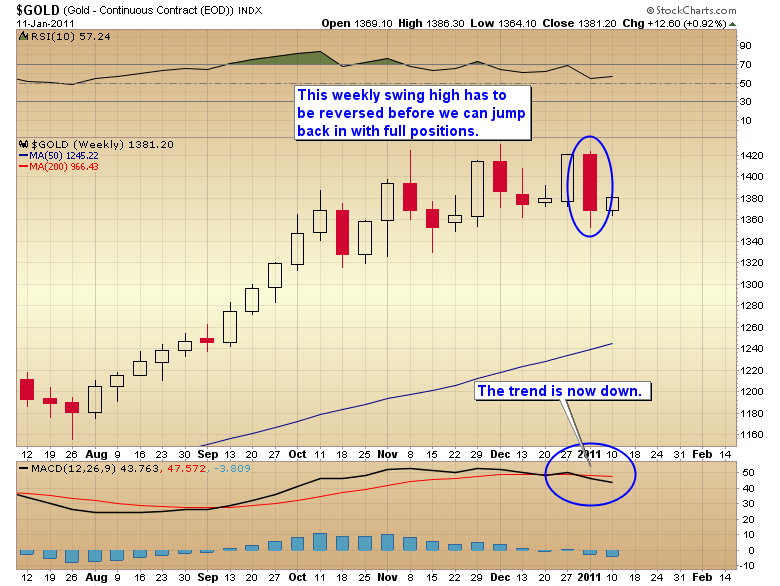 As of last week gold had formed a weekly swing high. That swing has to be reversed before gold can continue higher. Barring a severe correction we would need to see the pattern of lower lows and lower highs reversed in the sector before it is safe to jump back in the pool. Patience is called for right now. Ideally we would see gold continue down into an obvious yearly cycle low. If that happens we will try to enter as close to the bottom as we can. 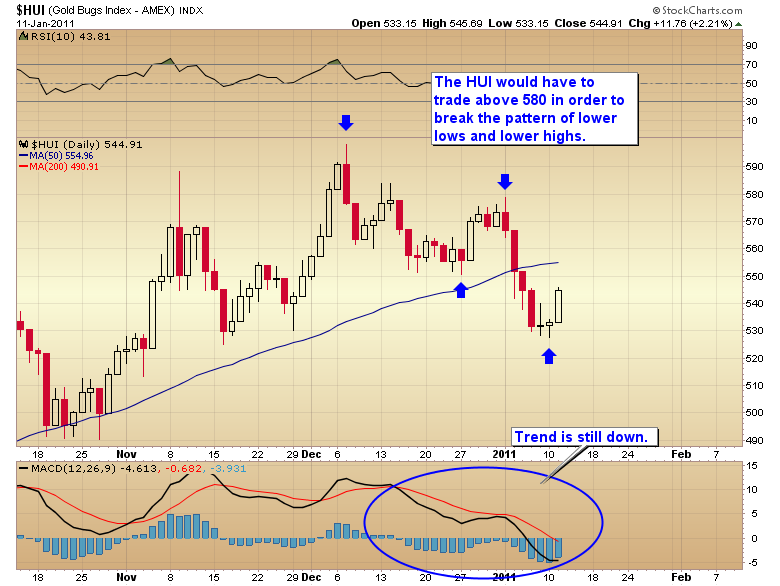 Barring that the sector would have to break the pattern of lower lows and lower highs before we reload positions. This entry was posted in Uncategorized on January 12, 2011 by Gary.